More socks. I loved my North Pole socks so much, I immediately cast on for another pair. The yarn is Dizzie Lizzes Knitting the Blues in the Marigold colorway. And let me tell you, Marigold is THE perfect name for this colorway. The photo doesn't do this yarn justice. In reality, it's a beautiful mix of yellow and dead leaf brown with just a touch of peach thrown in. Exactly like a fresh marigold bloom. I bought the yarn at last year's Montpelier Fiber Festival. The colorway is not exactly what I'd expected. 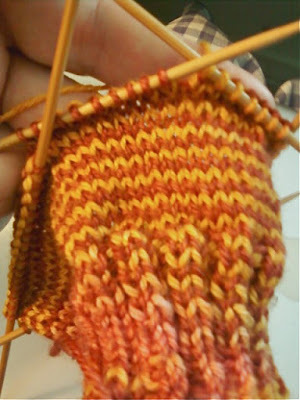 The sample sock that was displayed with the yarn showed wide stripes of color rather than single rows of color. But no matter the stripe width, I'm happy with the knitted fabric so far. The yarn itself is spun with Blue Faced Leicester superwash wool. It feels a little stringy in my hand, but the knitted fabric is delightfully soft. I have the feeling I'm going to love wearing these socks this fall. I probably shouldn't have said that. Putting that into words is probably a strong indication that SSS (second sock syndrome) will set in and I'll never knit the second sock. On a personal life note, it's been a fun week at work. Well, okay, I had a fun day at work and tonight promises to be fun as well. 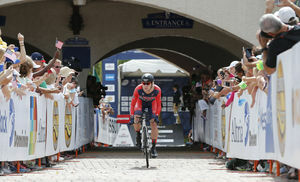 The UCI Road World Championship bike race is in Richmond this week and Wednesday's race was hosted by Kings Dominion. The race meant I got a few unexpected, but welcome, hours in (more pay = more yarn purchases) and I got to hang out with the cyclists at the starting gate for a while. The weather was perfect for racing and for the folks who simply came to enjoy a free visit to the park. As for tonight, Haunt starts. Working Haunt is always fun. Scary, but fun. Haunt is Kings Dominion's Halloween thing with haunted houses, scary mazes and creepy monsters roaming the park. And this year, I'm pretty dang excited. You know how I feel about clowns, right? Well, every year, they place a zombie clown statue between me and the bathroom & it freaks me out. Well, this year, they have the clown facing away from the path I take. Mr. Zombie Clown's back is to me so hopefully I'll be able to make the trip to the restroom without needing heart medication. I'm sending a huge Thank You! out to the maintenance guys/Haunt design team for that slight change. You've probably tacked on a few extra years to my life - or at least not removed them. What happens when it's TBT (Throwback Thursday) and football season? My mom's best day, ever! Have I mentioned my mom was a Redskins fan? Actually, "fan" doesn't really describe her. Fanatic would be more accurate. Did I mention we had Thanksgiving dinner on a Friday one year because the Redskins were playing on Thanksgiving Day? Have I mentioned how my mom would send me outside to play & lock the doors behind me so that I wouldn't bother her while the game was on? Have I mentioned that while all my friends' families were having big Sunday dinners, we had cold cereal for supper on Sundays? 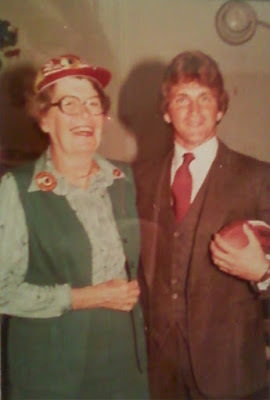 Have I mentioned that during the games, Mom would wear multiple Redskin pins, a Redskin baseball cap, a Redskin license plate type thing tied on string around her neck, and a Joe Theismann sweater my aunt knit? And have I mentioned that while wearing all that, she'd sit in her chair, eyes glued to the TV screen, cigarette burning in her Redskin ashtray, a drink in her Redskins glass, all while rubbing her Redskins paper weight, coffee mug and teddy bear while shouting, "Come on boys!" Have I mentioned coming home from a first date to find a queen sized sheet with "Hail to the Redskins" spray painted on it & nailed across our front porch? Have I mentioned that as a younger child, my allowance was based on my attitude towards the Redskins & my willingness to shout, "Hail to the Redskins" when ever we were out & about & saw someone else wearing maroon & gold? Have I mentioned that once I moved out of the house, Mom always, always called me after a win & would shout, "Hail to the Redskins!" into the phone then hang up without saying another word? It's weird, but since her death, Sundays are lonely. Those phone calls are probably the thing I miss the most about her. You can only imagine Mom's excitement when she got to spend a little time with Mr. Theismann during his visit to the cerebral palsy center where she worked. Thank you Mr. Theismann for giving Mom her best day ever. I sincerely hope you were not too traumatized by her. There's pie in the oven and pi on the mats. I finally got around to blocking my newest Elizabeth Zimmerman Pi shawl late last night. It's freaking huge! It measures 57 inches in diameter. It also has two spots where, well, I don't know what happened. It looks like I dropped a stitch, but there's a live top & bottom stitch, almost like the yarn broke. Except there's no loose, broken yarn ends. What ever happened, it's caused two big ol' holes that I'll need to repair. Other than that, I'm quite pleased with it. It's large enough to fold up & wrap around my neck scarf style and light enough that I'll be able to stand to wear it folded up & wrapped around my neck scarf style. It's also light enough to cram into my purse and big enough to use as a blanket in chilly movie theaters. In other words, it turned out just as I'd envisioned. If you're interested, for this Pi shawl, I used Tanis Fiber Arts Pink Label lace weight merino in the Midnight colorway. I used almost two full skeins. Remember me complaining about how long the bind off was taking? It turns out, I had a pretty good reason to complain. I started the second skein just three rows before I began the ruffle. The ruffle used up almost an entire skein. Did you get that? The ruffle used up almost an entire skein. The 57 inch shawl body was knit with one skein, the less than 10 rows of ruffle used up the other skein. Holy guacamole! No wonder it took me a month to knit the ruffle's icord bind off. Another interesting tid-bit.... While this photo of the shawl is horrible and the color is off, you can still see the slight color difference between the shawl's body and the ruffle. Two skeins of the same yarn, same colorway, and purchased at the same time. It just goes to show the unpredictability of hand dyed yarn. I'm loving the design element that unpredictability created on my shawl though. 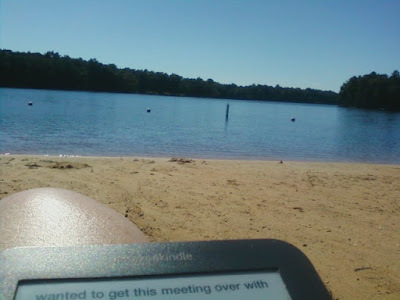 Yesterday was pretty productive. 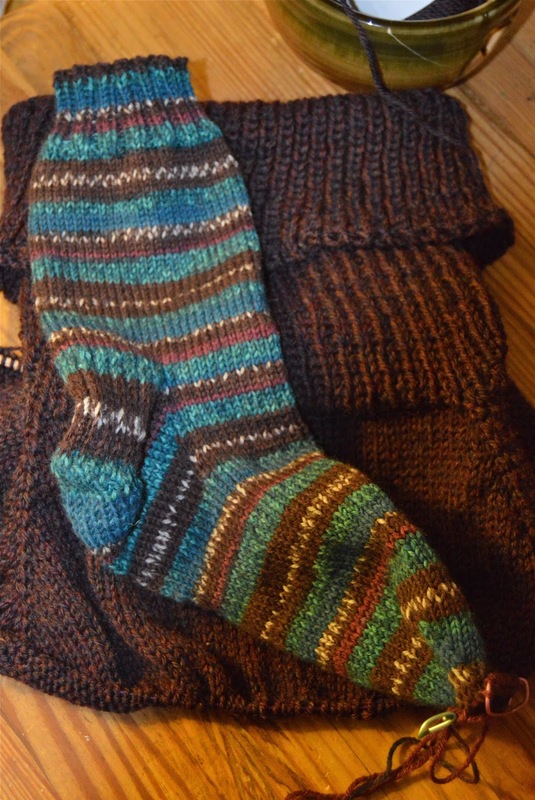 Not only did I block the Pi shawl, I also finished my North Pole socks. And yes, my left foot is that much bigger than my right. Pretty crazy, right? Anyway... the socks - I love them. No I don't, I LOVE them! They fit perfectly, they're warm as toast, thick enough for cooler temperatures but not so thick I can't get my shoes on over them, and, wait for it.... The stripes match! Boy, Google knows me well. I just Googled Regia North Pole Color yarn in order to provide you with a link and Google automatically took me to a Ravelry page. 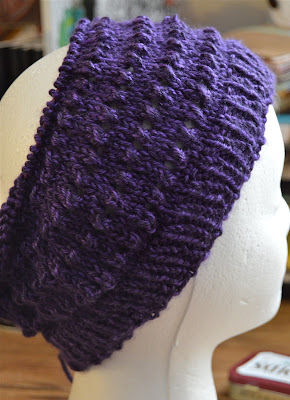 In any event, the yarn was Regia North Pole Color, a machine washable wool, and I used #US 2 needles. I'm crazy about the yarn and hope Google taking me straight to Ravelry doesn't mean that it's not made anymore. I'd love to get my hands on a few dozen more skeins. Pardon me while I have a mini rant. It recently came to my attention that our dogs were supposed to be licensed. Google provided me the information I needed as to where to purchase a dog license and off I went. Let me tell you, there is nothing like small town living. It turns out, the county's Treasurer's office is located in the DMV building that doesn't say Treasurer or even DMV on the outside. Nope, the building's giant sign says it's a bank. I wandered into the not-really-a-bank building, past the line for the DMV and into the Treasurer's area. There, I discovered that they only accept cash. Cash only! Good freaking thing there was an ATM machine in the not-really-a-bank/DMV/Treasurer's office parking lot. As I was leaving the not-really-a-bank/DMV/Treasurer's office and mumbling about what a scam a cash-only Treasurer is, I took a look around at the other local businesses. What an absolute perfect set up. Next door to the not-really-a-bank/DMV/Treasurer's office was a gun/ammo shop, across the street was a lawyer's office and behind that, the county jail. Meanwhile, no second sock syndrome here! 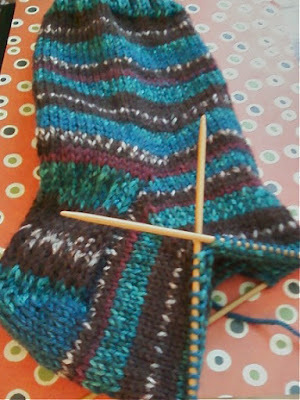 The second sock has a heel. Which is probably why I'm at home typing this and not hanging out in the county jail awaiting my lawyer and a court date. Well, my life just got easier. The outside of my house is decorated for Halloween & I didn't have to lift a finger. I did scream just a little bit & do the Holy Freaking Cow dance in the driveway. As you can see, we have a new visitor. I think I'd feel safer with the bear. I know, I know. Before you go all PETA on me, I know Mr. Spider is eating bugs and ... Well, that's the only good thing I can think of about spiders. But this guy.... he's HUGE and he's white with glowing orange legs and those legs move... Good Lord! Spiders creep me out so badly with the way they move their legs. I can't even type this properly because just the thought of the way spider legs move is making me twitch. I've decided to let him live though. Mainly because my husband isn't home help me load the gun. In other non-knitting news, it's been an exciting week. Both dogs went for their annual checkups and while I'm officially broke now, they both passed. And even more exciting than that - Minnie is too skinny! She's been on a diet for the last several years and she has somehow managed to exceed her goal weight. Per doctor's orders, she needs to put three pounds back on. Max is extremely jealous. As am I. The other exciting bit of news.... my daughter, the pathetically math challenged daughter, finished her first college math class with an A-. I am SO proud of her! I just realized my North Pole socks match my Autumn in Alta poncho. Both the socks and the poncho are coming along. The socks, a little slower than I'd hoped. I've been keeping them as an at-work project & work was much busier last weekend than expected. As for the poncho, it's fairly boring knitting, just rounds and rounds of stockinette with an increase row thrown in every so often. The pattern has three sections of increase rounds and I'm almost finished the second section so I tell myself I don't have much farther to go. A teeny tiny part of my brain keeps reminding me that the poncho is gaining stitches with each increase round and that, based on stitch count, I'm not even close to the halfway point yet. That thought is hanging out there in my brain with the memory of Mr. Spider. Luckily, I'm pretty good at slamming doors shut inside my head. They don't call me the Queen of Denial for nothing.